Limey made a comment my club's website that I have pics of my car there, but none here. Now that the school semester is over, I have time to play on the pc. Here is a picture I took in my work parking lot, through the upstairs window. Not the best picture with the reflections from the trees showing all over the paint, but I like it anyway. Very Nice I really like it !!!! I like it too! The 4th gen of Chevelles/Malibus, and El caminos are my favorites. 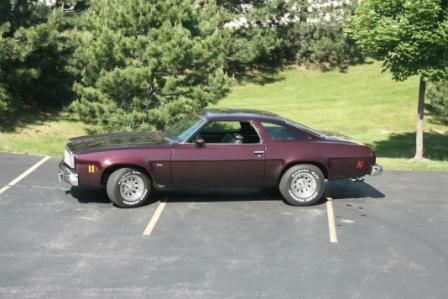 My '74 Malibu is my second one, and I'm on my 4th Elcamino from that era. I like the color on yours. Very nice color, I like. BTW, it's about time you posted up at least one good pic on here for us! Sweet ride, something about that pic and stance makes it look compact! » Post your 2011- 2012 snow pics. » Xp 900 flares on Rzr-S Pics?